'Q' was one of my tough letters as I couldn't come up with a decent design. I even resorted to looking through the dictionary and still came up short. 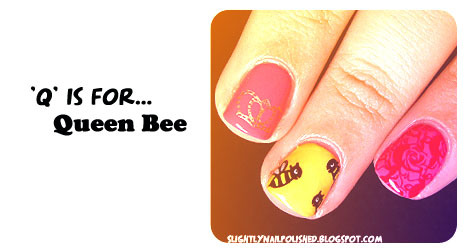 But then when I was flipping through my stamping plates I say those lovely bees. Then I saw a crown. And that was when it clicked. I decided to go with my current favorite color combo, pink and gold, for this design. I thought that pink represented the girly queen bee where the gold represented her honey. Oh, and the design on my index finger are roses. I found that some people had a hard time distinguishing between the positive and negative space... which I can completely understand. I even fell victim to that after someone pointed it out to me. Not many pictures, sadly. I forgot to take more! I'm batting a thousand with this one. And for a list of polishes and supplied I used, please refer to the list at the bottom of this post. I used so many polishes I can't remember off the top of my head. I hope you enjoyed this design as much as I do. Stamping Plate- Cheeky Jumbo Plate 7 "Wild At Heart"